This entry was posted in Pixel Scroll and tagged Borderlands Books, Carrie Fisher, Colson Whitehead, David Klaus, Godzilla, Harlan Ellison, Harry Potter, Ishiro Honda, J. K. Rowling, Jim Barker, John King Tarpinian, LIGO, Marcin Klak, Nat Segaloff, Octocon by Mike Glyer. Bookmark the permalink. Suddenly the Recommended SF thread has become active again, and as a direct result Mount Tsunduko is eight volumes taller. Darn you, Filers! <shaking fist> Darn you to heck! Ooo, haven’t had a scroll title in awhile. Thank you. It’s always safe to go to the Shakespeare well. Have we done “a long scroll to a small angry pixel”? “I fought the TBR but the TBR won”? Ryan H: I think we used that one on October 23, 2017…. I would like to honor this occasion of a first fifth by premiering Kirkus Reviews’ new staff members. Okay, so I waited too long and now it’s not even a false fifth. Whatchagonnado? Re: 12). I find the Wonder Man bit about Stan deciding to kill him off due to DC objections a bit odd, given that he died at the end of his first one-issue appearance. So unless DC found out about the character far enough pre-publication to object, it’d seem he was planned to die all along. Oddly enough, they don’t mention two generally considered coincidental simultaneous ideas; Marvel’s Man-Thing and DC’s Swamp Thing were very close to debuting together and creators Gerry Conway and Len Wein were actually rooming together at the time. On the other hand, both are also similar to Golden Age swamp monster the Heap. OMG, had trouble tearing myself away from Emily’s cartoons! Thanks for directing me there, JJ and Mike! But one of them’s a group of four heroes, with a nickname that abbreviates to FF, led by a genius scientist, with an orange strongman, a blazing flying guy and a girl who can (appear to) vanish, and they bicker all the time. Barker ill too? Man, what IS it with us fanartists lately! We’re all sick or in fact health, lately. I think it’s a conspiracy… I’m look to a fanartist who IS in good health, who — by process of elimination –must the the conspirator. Also, time travel, anti-gravity, the philosopher’s stone, and invisible pink unicorns. @Darren: how do you know we don’t already have invisible pink unicorns? Because I cannot order an invisible pink unicorn steak. Same reason I don’t believe in bald eagles, jellyfish, or humans. I prefer my invisible unicorn steak with just a little pink on the inside. Tales From The Froot Loop. Maybe the writers whose unpublished stories Ellison hung onto year after year for The Last Dangerous Visions should have started mailing him dead gophers, to try to get him to either meet deadlines and publish their work, or admit publicly that the book wasn’t happening and cancel it so they could sell the stories elsewhere. I realize it’s not that simple: sit on it long enough, and a ground-breaking story stops being ground-breaking, and eventually becomes trite and unsaleable. @Soon Lee – The TBR pile always wins. Maybe not today, maybe not tomorrow – maybe not even this month. But the TBR pile has infinite patience, and I do not have infinite willpower. Froot Loops was Howard Wolowitz’s NASA nickname on The Big Bang Theory. Anyone catch Neil Gaiman (Nail Ghoulman or something in the credits) as a talking cat on the Simpsons version of Coraline last night? Remember when you could pick up a box of Froot Loops and get Froot Loops? 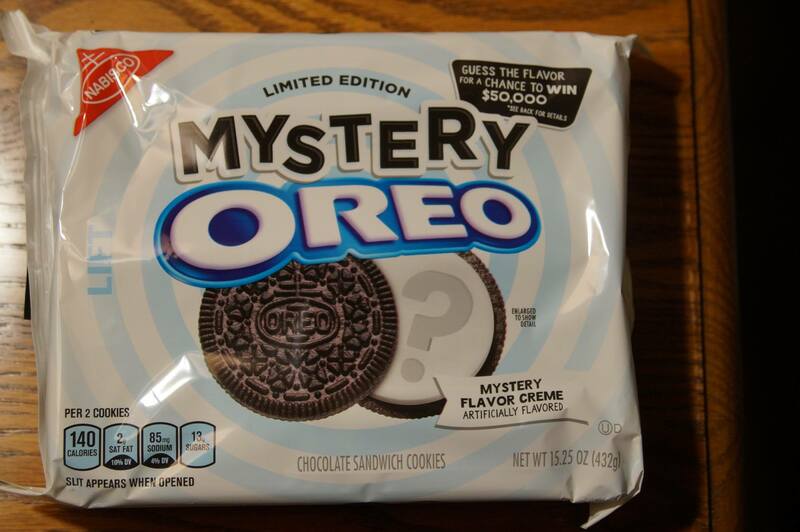 Now to get the Froot Loops taste, you have to buy Oreos, which BTW are required to have twice as much black as white! Bonus Meredith moment – Allison Littlewood’s The Hidden People is on sale for $2.99 on the US Amazon. It’s been $12.99 since publication, according to eReaderIQ. You may remember Littlewood as the author who bowed out of the Dragon Awards when she found she had been slated onto them. @Geoffrey Lamb: Well, I had jellyfish soup once. Does that count? Im leaving for the Essen Boardgame fair tomorrow and dont know the internet situation. So dont read anything I wouldn’t read. And dont read anything I would read. In between is a small grey area of hard sf, and that where you operate. Oh, but you can. It’s right there on the menu, written in invisible ink. @Peer: Never had it in soup, but I’ve had jellyfish with glass noodles and it was soooooo good. Generations (non-cable antenna network) was showing lost (or forgotten) television series this weekend. One of the series they showed some episodes from was One Step Beyond. I kept thinking of Madness. 15) Oooh, those are my Irish eyes on the left of the photo of the Future Fashions panel, desperately scanning the moderator’s ‘suggested questions’ which I didn’t really need because the panelists were amazing; just as well as it was mostly a page and half of ranting about pockets. We’re off to see the pixels, the wonderful pixels of scrolls. I’ll get you, my pixel! And your little scroll, too!! It’s scroll, Jim, but not as we know it. Harry Pixel and the Scroll-Blooded Prince?